We will need images clearly showing the possible defect you want to report. Thank you. Please review our Footwear Limited Warranty description. Please review our Footwear Anatomy Illustration to help with your defect description. Note: The manufacturer REQUIRES at least one photograph be of the bottom, the soles, of both boots and at least one or two photographs of the defect being reported. The one exception is any issue related to the interior of the boot that cannot be photographed. Shoe Compnay, for their review. Please allow 3-5 days for a response to your DRF submission. Within 45 days of delivery - obvious failures in construction due to errors during production = boots replaced. Within 60 days of delivery - unexpected failures in construction in combination with the physical stress of work conditions and use; six of one, half a dozen of the other = boots not replaced; 50% credit applied to purchase. Within 120 days of delivery - wear and tear on outsole and leather upper - age of boots; the time they have been worn; not necessarily a production defect but related to use = boots not replaced; 25% credit applied to purchase. Results are solely at the distriction of the representatives of TheBootPros LLC and the Weinbrenner Shoe Company. Decisions are made fairly and based of consumer expectations and condition of the boot at the time the defect report is submitted, and photography provided. Result #1: Boots demonstrate a major defect, unrepairable, in the manufacturing process. Your boots WILL BE REPLACED. Result #2: Boots demonstrate a minor defect, repairable, either as a result of the manufacturing process in addition to normal wear and tear in the first 45 days of use. In this case, TheBootPros LLC will pay up to a maximum of $15 if you decide to get your boots repaired by a local cobbler/shoe repair professional. Receipt must be submitted for reimbursement. Result #3: Boots demonstrates the characteristics of poor foot alignment, pronation or supination, as reflected by uneven wear and tear on the outsole. In this case, the reported "defect" is NOT considered a result of the manufacturing process. Your business is important to us. Selling American made, union made, footwear is equally as important to us. We understand that you did not find what you were looking for, but if we can be of any further help - give us a call. 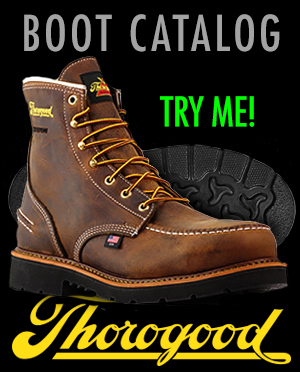 Whatever boot you end up buying, make sure it's 100% American made. We cannot guarantee that the replacement product will be in-stock. However, we will contact you via phone or e-mail if your style or size is unavailable. Items should be packed in their original boxes and returned via USPS, UPS or Fed Ex. CODs are not accepted. Please retain any tracking numbers provided by the shipper for reference purposes. Shipping costs associated with returned items are the responsibility of the buyer, except if TheUnionBootPro.com shipped an incorrect item related to your original order OR the items ordered are defective. Dependent on your credit card provider, refunds may take 1-2 billing cycles to appear on your statement. to any customer's identity being compromised or account information being misused. Your business is important to us. Selling American made, union made, footwear is equally as important to us. If we can be of any further help - give us a call.